Modular origami is back! This time, I’m authoring it. However it wouldn’t be possible without Sakuradama (KAWASAKI Toshikazu), Temari Sakura (FUSE Tomoko) or some beautiful kusudamas like Plumeria Flower Ball or Petunia Flower Ball (Meenakshi MUKERJI). And of many more kusudamas! Thank you very much! As soon as I find the last two kusudamas (they are stored) I’ll photograph them and post them here. They are very beautiful! You can see the Sakuradama on this post and the Temari Sakura on this post and this more recent one! 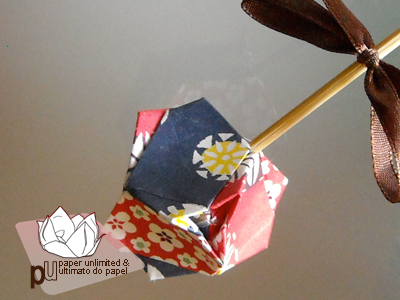 Once again you can find this origami in Waribashi! You can click here to view/ download the pdf. The best folding paper for this one is thin paper, but strong too. Any kraft paper provides these qualities; there are many wrapping papers that are good for this, too. 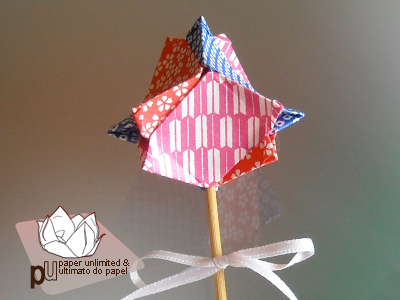 You should fold a couple of units first to test the paper and the assembly. With kraft paper, or similar, 7×7 to 9x9cm / 2,75×2,75 to 3,5×3,5″ are best; if you use copy paper (80g/m2, for example) it’s best to use squares of 10 to 13cm / 4 to 5″ (side length). Unit folding has many steps but is, even though, simple. You need to crease well all folds; the next step usually inverts the fold or uses it as a guideline. If you don’t understand the fold you may, and should!, look at the next steps: the fold is either complete or further explained. In the final steps two variants are shown; they give the finished model a different effect. Notice that these units allow symmetric, or mirrored, units so be attentive; all units need to be of the same type because “left” and “right” units don’t fit into one another. Some assemblies the unit allows are with 6 units (cube or hexahedron), 12 units (starred octahedron) and 30 units (starred dodecahedron or icosahedron). If you plan on assembling the cube, you only crease the top and bottom of the first crease so you can use it as a guide for the second step. On all the other assemblies you need to fold that crease. On the cube all units are assembled in a 3-3 basis, «petals» or not. 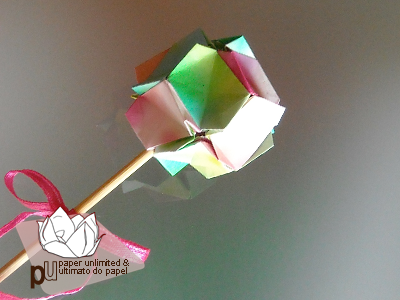 On the octahedron they are grouped as 4-3, flowers with 4 petals, and with 30 units as 5-3, flowers have 5 petals. 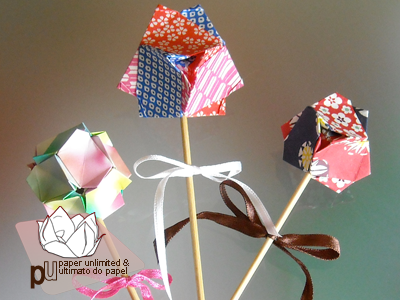 PS: There are more variants of this kusudama. They will be presented soon! Soon as in next month or the other (; They’ll be presented as soon as I find the time to complete the diagram and fold all the models… Well, and photograph them but that’s the easy/ fast part. 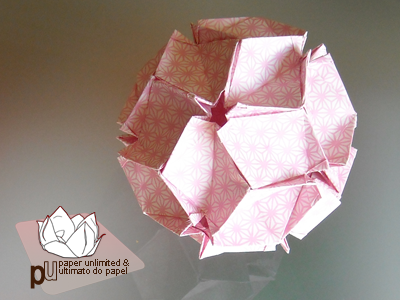 Shunka Temari/ Spring Flower Ball by Paper Unlimited is licensed under a Creative Commons Attribution-ShareAlike 3.0 Unported License. This entry was posted on 2011|05|02 at 15:44 and is filed under diagrams, kusudama, modular origami, origami. You can follow any responses to this entry through the RSS 2.0 feed. You can leave a response, or trackback from your own site.